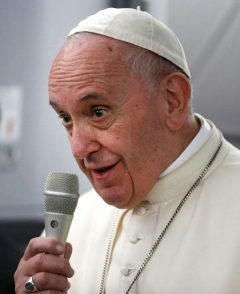 I am touched by the Holy Father’s willingness to share the fruit of his prayer as it unfolds on such important matters.It leaves him vulnerable, however, to misinterpretation by those seeking a change in the current discipline of a celibate priesthood. Deeply prayerful he stands committed to a celibate life that gives witness to the mysterious love of God and makes possible the service God’s people deserve. Can a celibate priesthood as the norm exist alongside a married priesthood in special circumstances? It seems to me that we already have an example of this in the reception of married Episcopal / Anglican priests and their families into the Catholic Church. Some of these men have been ordained as Catholic priests and serve the spiritual needs of other men and women seeking communion with our Church.